For the month of April we are offering customers the opportunity to discretely deposit any unloved suit in complete anonymity. It’s our job to know the difference between a good suit and a bad suit but we hereby swear not to laugh, embarrass, ridicule or scorn. In fact, quite the opposite. In return for your ‘trade-in’ we will pay £100 towards a beautifully tailored bespoke suit to replace the aforementioned item. And not only that. 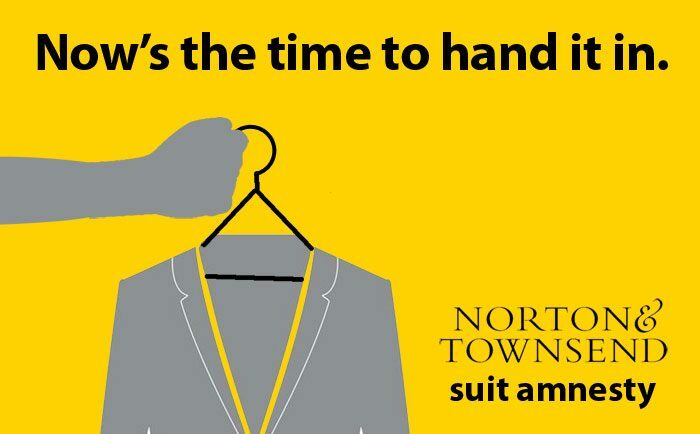 Any suits that are not particularly embarrassing or worn out will be brushed down, pressed and handed to the charity Suited for Success in response to their need for work attire for their unemployed and homeless clients. • You give us the suit you don’t want. • We give you £100 off a beautiful replacement. • Your unwanted item may then help someone else in greater need. Give us a call, our doors are open.